BRUSSELS — Who is track's greatest runner? Long-distance star Kenenisa Bekele wonders what it would be like to race sprinting great Usain Bolt. "If Usain agrees, if someone wants to organize this, I am ready," Bekele said Thursday, a day before the Memorial Van Damme Golden League meet. 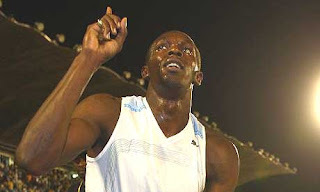 Bolt, of Jamaica, is the reigning world and Olympic champion and world record-holder over 100 and 200 meters. 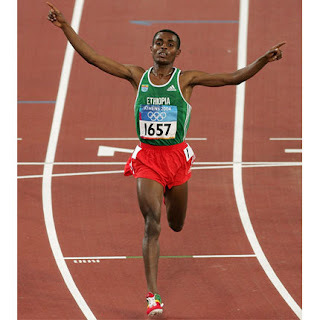 Bekele, of Ethiopia, is the reigning world and Olympic champion and world record-holder over 5,000 and 10,000 meters. The idea would be to find a middle ground — between 600 and 800 meters. "I think I am pretty good at 600 meters," Bolt said last week. Above 800 meters, he said, "I have no chance." Bekele also thinks the two could meet at about that distance. "Six-hundred meters is a good chance for him," said Bekele, considering he would lose too much over the first lap. "I need some 800 meters, maybe 700 meters." A Bolt-Bekele showdown would be the biggest match race since 200 and 400 Olympic champion Michael Johnson raced 100 champion Donovan Bailey over 150 meters in Toronto after the 1996 Atlanta Games. Johnson pulled up lame halfway through that race and the legacy of the event is more a joke than anything else. Bekele's manager, Jos Hermens, realizes that Bolt dominates the sport to such an extent that even a superlative performance like Bekele's 5,000-10,000 double at the Olympics and worlds became merely a footnote. "I will have to think about it this winter," Hermens said, referring to a potential matchup. He added that he will be in touch with Bolt's manager, Ricky Simms. Bekele is often overshadowed and he is still chasing the worldwide acclaim enjoyed by compatriot Haile Gebrselassie. Bolt's showmanship and stunning performances have made him one of the most marketable athletes in any sport. When it comes to official performances, the two get no closer than the 400 for Bolt and the 1,500 for Bekele. Bekele set a personal best of 3 minutes, 32.35 over 1,500 two years ago, a time that would make him the 13th best performer of 2009. Bolt's top mark over 400 is 45.28 in 2007, which would be the 28th fastest time of this year.